Although a lot of shoes have needless decoration on the top and sides, multicolored soles in athletic shoes often are there for a reason. Some of those different colored materials are denser than others, so they're placing it strategically for control. It's somewhat hard to assess the construction of the Starbury One because the leather extends to the bottom of the shoe, thus obscuring its depth. 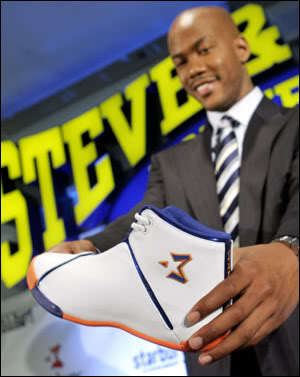 Stephon Marbury and his $15 basketball shoe, a price that almost any family can afford. Stepping out of a snow-white stretch Hummer, NBA star Stephon Marbury arrives in style at the spanking new Steve & Barry's University Sportswear store in Culver City. The lavish ride is somewhat out of sync with the radically affordable $14.98 Starbury One basketball shoe he's promoting, but the folks waiting in line for more than an hour to see him don't care. They're here to see the maverick N.Y. Knicks point guard. Some are even interested in the shoes. The low price of the Starbury One -- which Marbury plans to wear on the court this year -- has generated huge publicity and plenty of debate about the quality of the shoe. Marbury insists that it is comparable to other high-end basketball shoes. "It's the same shoe. The same shoe," he says, laughing in exasperation as he sits down and begins signing shoes and other apparel. Well, yes and no, says Dr. Bob Baravarian, chief of podiatry at Santa Monica-UCLA Medical Center. Baravarian took the shoe for a spin in the waiting room at the Foot & Ankle Institute in Santa Monica, where he's co-director. Hopping around in blue scrubs, with a 5-foot waterfall in the corner drowning out the sound of traffic on Wilshire Boulevard, Baravarian jogged a few laps down the hall then came back into the room. "I've really been wanting to try these out," he says. He then sat down, took off the shoe and examined it closely. He put one hand on the toe and the other hand on the heel and gave it a good twist, like a dishrag. His colleague Dr. Gary Briskin, co-founder of the institute and an assistant clinical professor at the UCLA School of Medicine, popped in and tried on the shoe next. He then took it off and gave it a good twist as well. Apparently twisting a shoe is like thumping a watermelon. The way it twists tells a lot about the stability. Baravarian found the shoe to be a little soft, though Briskin found it "a lot soft." That's a key point. The softer, or more flexible, the shoe is, the less support it will provide. Although a lot of shoes have needless decoration on the top and sides, multicolored soles in athletic shoes often are there for a reason. "Some of those different colored materials are denser than others," says Briskin, "so they're placing it strategically for control." It's somewhat hard to assess the construction of the Starbury One because the leather extends to the bottom of the shoe, thus obscuring its depth. "So you don't know the level of technology," says Baravarian, "but just from the looks of it, it's got a standard sole, a foam layer." A top-of-the-line shoe will often have more dense materials, such as a piece of plastic in the sole for added support and to prevent roll motion. The high degree of flex, or torsion, in the shoe is actually intentional, says TJ Gray, who crafted the shoe with his colleagues at the sports gear design firm Rocket Fish in Portsmouth, N.H. Gray estimates that he has designed hundreds of shoes for Nike, Puma, Reebok, Saucony and others. How much torsion an athlete prefers will depend in part on the sport and in part on the athlete's personal preference. "Basketball has more lateral, or side-to-side movement, so these big guys want some of that torsion," says Gray. "Stephon specifically wanted a very flexible, very fluid shoe that moved with him, versus restraining what he did. He wants to feel the court." The shoe, made exclusively for Steve & Barry's, was developed over an eight-month period, as the designers went back and forth with Marbury, tweaking the design to meet his specifications. "When we first heard they wanted to sell the shoe for $15, we thought they were joking," says Gray. "But we didn't take any shortcuts, and the shoe you see is the shoe we designed. It has the same materials, everything." But the high degree of torsion could cause pronation problems for people with low arches, Baravarian says. Pronation, a condition in which the ankle turns inward, can cause bunions, tendinitis and plantar fasciitis over time. However, he says, a simple fix for this is to purchase a stiff insole, available at sporting goods stores. Common foot problems among many high school and college athletes that Baravarian and Briskin treat are often directly related to shoes. A shoe that is too soft, for example, may create heel pain. Stitching on the inside of the shoe can irritate the foot. The two deemed Starbury's insole acceptable, without excessive cushioning. Too much cushioning, they say, can cause the foot to roll to its side and won't provide enough leverage with which to push off properly, thus reducing acceleration. But for the average 16-year-old, with good feet or, lacking that, a proper insole, the shoes are structurally acceptable, Baravarian says. The price tag, he adds, elevates them to "awesome." According to Baravarian, kids' feet are more forgiving than adults, for whom the slightest abnormality can cause pain. "A kid's body is so loosey-goosey, they adapt much easier," he says. Can a $15 shoe have game?